I must admit to being a bit of a gadget addict...If I can find a gizmo to do a job, be it in cooking, hat making or sewing then I really am useless at resisting. Quite a lot of the gadgets I buy are, to be honest a bit of a waste of time and money.... Rouleau loop turner-just use a safety pin, thread snips- just use a pair of scissors like any normal person! However, some of them are worth their weight in gold and I would probably go quite mad without them. So these are some of my total essentials that I would recommend anyone who sews a lot invest in. This rather marvelous gizmo makes sewing annoyingly slippery fabric a doddle. 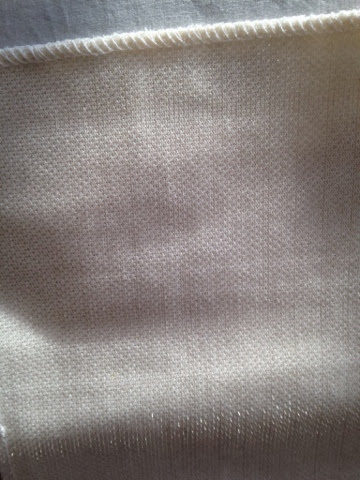 Some fabrics like satin or velvet (or any fabric with a pile ie a furry surface) just will not stay still when you try ad seam them together, no matter how much you pin or baste them; I've even been known to baste and pin out of sheer desperation... Other fabrics like leather, can stick together when you seam them (and actually velvet can do this as well depending on the way the layers are laid). So they bunch up under the foot and end up all folded and lumpy. This can result in many seams having to be resewn and a serious waste of time! The walking foot ensures that both layers of the fabric get fed under the machine foot at the same rate- with a normal foot the under layer tends to get moved a bit faster than the top layer as it is in actual contact with the feed dogs. 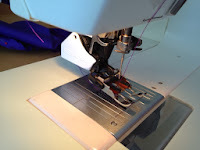 Add to that a slippery fabric or a sticky fabric and it ends up getting very, very frustrating, until you put the walking foot on the machine and then you can sew all these irritating fabrics with total ease-marvelous! This is particularly useful when you have a costume designer who loves velvet! 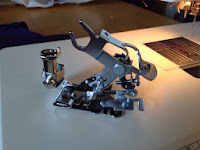 This foot is available from all major sewing machine manufacturers and is really worth its cost. This foot isn't as useful as the walking foot, in fact it is really quite frivolous! It creates beautifully pleated trim that can either be made up by itself or sewn directly onto the project as it is formed. 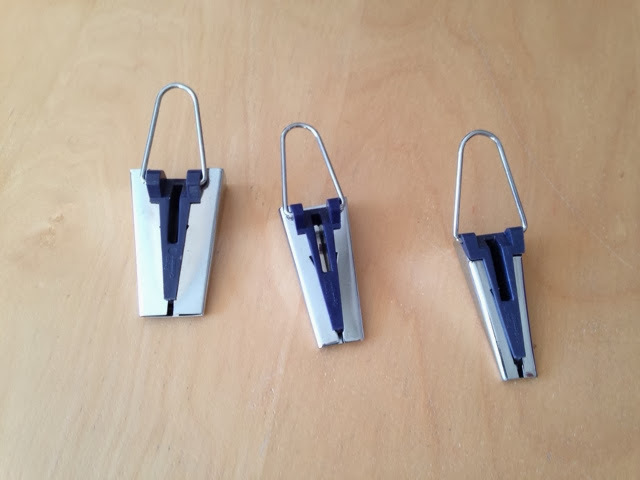 It works by harnessing the movement of the needle (with the fork like arm being fitted over the needle attachment arm) which powers the front arm to push tucks into the trim. 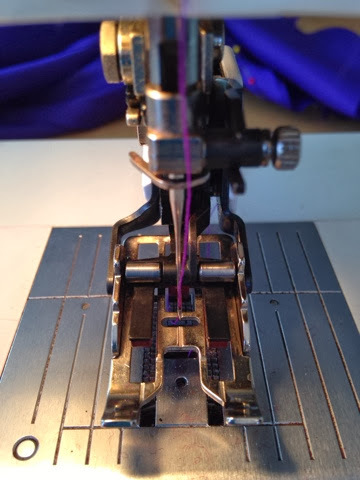 Its a bit difficult to explain clearly so if you want to see exactly how it works the watch this video by Heirloom Creations. It is such a fun deice and you can alter how many ruffles it makes by adjusting the lever on the front (in the pic to the right) so that you get a tuck every stitch, every six stitches or every twelve stitches. You can also adjust the look of the ruffle by changing the stitch length. 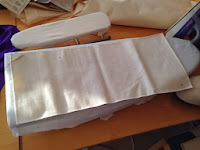 I use this foot a lot when making petticoats, as it is so much easier to ruffle up fabric with this foot than having to gather the darn stuff by hand. I also love to ruffle up ribbons as a decorative trim, I used this to finish the edge of my cerise mini tricorn which would have taken forever if I had had to make it by hand. Exactly what it says it is- a miniature iron. 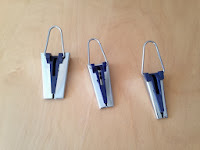 It is extremely useful for ironing seams open and getting the points of darts nice and flat. It is also invaluable for hat making- it makes forming felt into valleys, such as those in the crown of a pork pie hat, so much easier as you can get the heat and steam easily into the felt and it forms beautifully into the block. 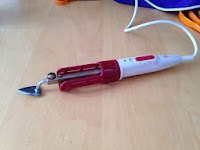 I also use it for flower making as you can use the sharp edges and point to makes really sharp folds that don't flop, you can also get extra ends for shaping petals too. All in all, my mini iron is on the ironing board all the time. One for hat makers here, another fairly self explanatory tool-you use this for pushing pins into hat blocks. As my health has got more annoying I find this invaluable as hat blocks as necessarily, really hard! 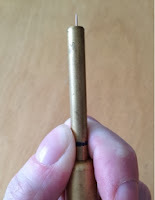 SO this gizmo holds the pin in the tube with a small magnet, and then you can push the tip of the pin into the block and the handle lets you use your whole hand to push the pin in. 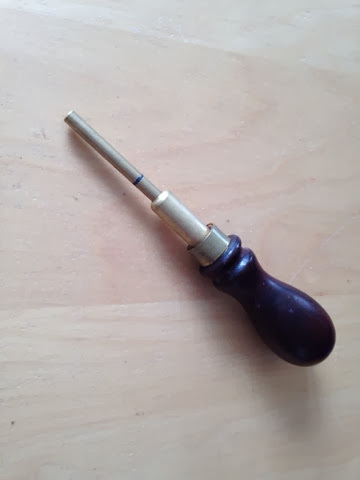 It really does give you much more control with how deep you push the pin in than using a hammer as I've seen some books recommend. Frankly my hat blocks are beautiful and expensive, and I don't want to ruin them by hammering pins into them (as suggested in some books!) that I then cant pull out! 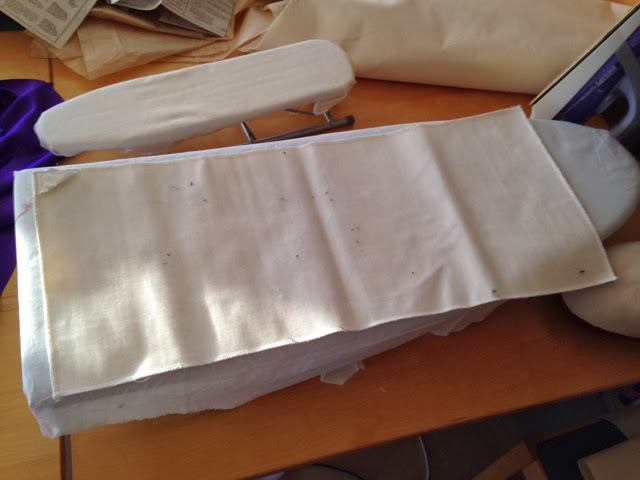 So bias binding is really easy to make without a tool, but it is a bit time consuming and I always manage to burn my fingers when pressing it. 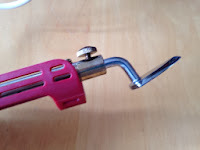 So if you want it nice and even and no burnt fingers, then these tools are definitely worth it. I use a lot of bias binding in hat making so these get used a lot. 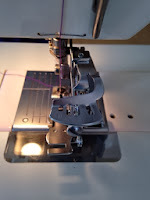 They are very easy to use, you cut your length of bias ribbon and then gently feed it through the tool which forms it into the folds you need and you press it as it comes out of the tool and ta-da lovely, even bias binding. 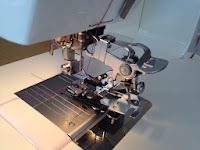 This video by Whipstitch shows just how easy it is to use. Another too to help deal with velvet-it really is a fiddle to work with! Any fabrc witha furry surface is a pain to iron because as soon as you press it (on the reverse of the fabric, you never put an iron on the pile!!!) all the pile (the fur) gets flattened down and it looks, well, a bit rubbish. You then can try and brush it back to looking good again, or only ever steam velvet with a garment steamer (expensive things, and not always that good at removing creases) but with some velvets, especialy silk velvet once pressed flat the fabric just never looks as good again... I found this whist making myself and evening coast from burgandy silk velvet. It was driving my nuts, until the nice lady in John Lewis mentioned you could get these cloths especially to cope with velvet. I had to order it online but it is fantastic! It is basically a large piece of velcro- all the little hooks merge with the pile as you iron it on the back of the fabric. This prevents the pile from being all squished and when you lift the fabric off, the slight grip of the hooks pulls the pile out and ta-da! No more rubbish looking velvet! Close up of the little hooks. Well those are certainly some of my favorite tools that I would really struggle to cope without. If anyone out in the interwebs has got some personal favorites do comment, I would love to know as I would hate to be missing out on another fab gizmo! Haberdashery is usually taken to mean all the small items, such as buttons, zips and thread that are used in sewing. To me haberdashery (or dashahabery as I once spoonerisumed!) also includes all the pretty things in sewing like fringing, beads, cord, tassels, sequins, and anything that you can add to a garment to make it even prettier or more sparkly! Barnett and Lawson, Little Portland Street. This is one of those shops that it is impossible to enter without buying something- I've certainly never managed it! They provide all sorts of trimmings-ribbons, braids, cords, buttons, buckles, fringes, flowers, motifs, tassels, sequins, ric-rac, you name it, they almost certainly have it and in a range of colours and sizes. Their basement shop is filled to bursting with so many beautiful things, at very good prices and I don't think I got through any show without at least one trip here. They don't do online shopping, but do offer a very good sampling service. For anyone of a magpie disposition like me, this place is heaven! Macculloch and Wallis, Derring Street. Another fabulous source for all sorts of haberdashery, trims and decorations, and also fabric and workroom essentials; Macculloch and Wallis have been supplying the theatre and fashion years for over a century from their central London store. They are more expensive than Barnett and Lawson, but all their products are of excellent quality. You can order online, but I do find their website a bit annoying. Many of the pictures of their products, particularly the fabrics, suggest that they are available in several colours, but when you try and order them they are only available in maybe one or too-this can be rather annoying hence why I don't tend to get much fabric from M&W, but do order trim, zips etc. Probably the last specialist haberdashers left anywhere, their Noel Street shop is currently undergoing renovation, but you can still order online -thank goodness, I rely on them for so many things! If you need specialist corsetry supplies, zips, buckles, buttons, webbing, purse frames, fasteners or any random specialist sewing tools, then Kleins probably has it. The Zip colour matching service alone makes Kliens one of my life saving companies. They also have a great range of trimmings, ribbons and decorative items that are wonderfully drool worthy. Can't wait for the shop to reopen in March! Not exactly a haberdashers, as they supply so much more than that (their catalogue has over 5000 items! ), but a very good source for thread, particularly large overlocking spools. Morplan is another place I was introduced to at RADA when I was taught pattern cutting, as it is where we bought our marvelous pattern drawing tool - the Patternmaster. This is a combination, ruler, set square and grader that I use constantly. I also get all my pattern paper, card, cutting shears and garment bags from this company. 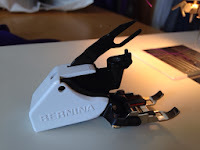 They also do very reasonably priced dress forms and all sorts of workroom tools.